And so the evidence builds, my evidence against the corrupt benefits system. I have to prove that I was unable to work as of June 2011. As can be viewed here I started to be ill in June 2010, in fact it was earlier but this is the time I could no longer work and had to go on the sick. Eventually we found it to be a condition sarcoidosis, at the time I was employed as a healthcare support worker at Airedale Hospital. 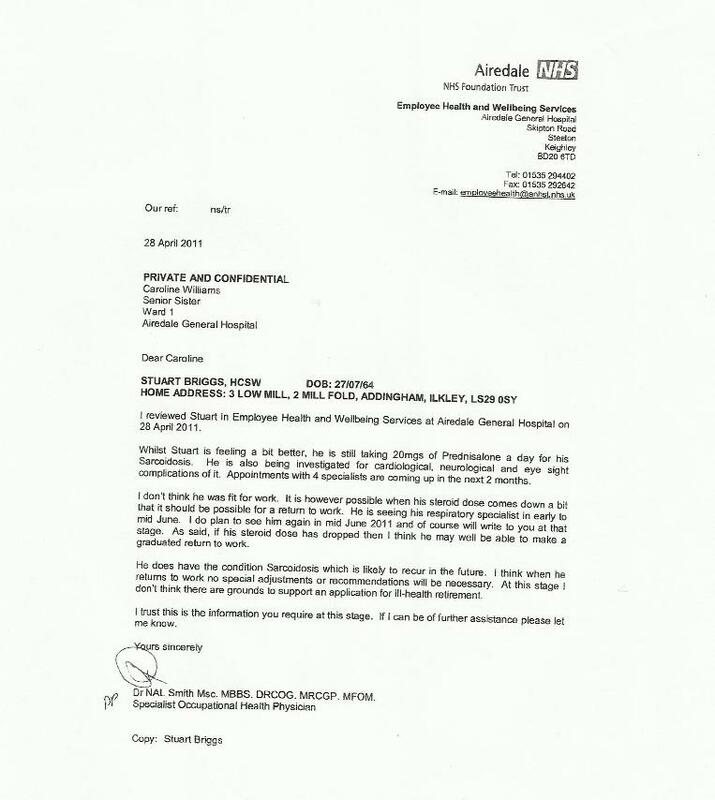 As of June 2011 I was not allowed to return to work, jointly because of my medication and the fact I have sarcoidosis, both of these combined and working with ill folks are not good ideas as it could well have seriously put my health in a perilous position, you can view one of the letters from the hospital doctor below. It should be clear cut in my favour but as so many sarcoidosis sufferers find out the system and its helpers in ATOS seem to struggle to recognise sarcoidosis, what is sarcoid they should ask, well sarcoidosis is/can be a serious medical condition and despite many folks views it can most certainly be fatal. It were not until the end of 2011 that the consultants decided to reduce my Prednisolone, that resulted in my lungs getting some serious attacks from the sarcoid and therefore to double my original dosage of 20mg/day to 40/day. This entry was posted in Blog, Sarcoidosis and tagged Sarcoid. Bookmark the permalink.